The mallee regions of south-eastern Australia, although very dry, have a diverse range of bird species. A summary of mallee National Parks and conservation reserves for this region are included in the cover. This CD presents a range of calls of birds known for their amazing vocal abilities as well as those that are known only to this region, or are difficult to observe. Species which mainly occur in mallee include Malleefowl, Mallee Emu-wren, Shy Heathwren, Black-eared Miner, Yellow-plumed Honeyeater, Southern Scrub-robin, Mallee Whipbird, Chestnut Quail-thrush and Red-lored Whistler. Other more difficult to see species include Scarlet-chested Parrot, Black-eared Cuckoo, Spotted Nightjar, Striated Grasswren, Slender-billed Thornbill, Purple-gaped Honeyeater, Crested Bellbird and Gilbert's Whistler. Where possible, a variety of calls of each species are presented. This allows the listener to become aware of the repertoire of sounds many of the birds possess, particularly songbirds. This album has no music or spoken commentary. The natural calls of the birds of this region can be appreciated both as a source of pleasant sounds, or as a well documented reference source of many of the mallee bird species. A list of the species, with call description and behaviour notes, can be found inside the cover. For those people with a particular interest in any of the calls, further information can be obtained from the author. This is another CD in the Australian Bird Call series and contains calls of 78 species. 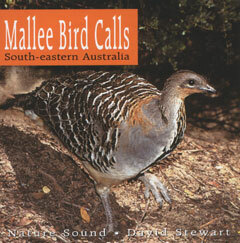 Birds Australia, the largest bird organisation in the country, endorses and recommends this CD to anybody interested in enjoying and knowing the calls of many of Australia's wonderful birds found in the mallee regions of south-eastern Australia. the relevant State National Parks & Wildlife Service to enquire about visitation.